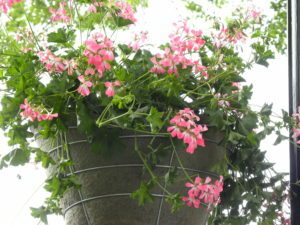 As part of our on-going mission to improve the quality of life and overall image for all those who live, work and visit Port Washington, the Board of Directors of the Greater Port Washington Business Improvement District (BID) has placed 148 beautiful pink cascading geranium hanging baskets on the Town of North Hempstead’s Battery Park Lamppost located along Port Commons (Port Washington Blvd) and Main Street. The Greater Port Washington Business Improvement District (BID) has been hanging beautiful flowering baskets on these lampposts for many years and it adds a special touch to our town. We hope that the residents and visitors of Port Washington enjoy these flowering plants. A special thank you to the Town of North Hempstead for watering these plants so they stay looking beautiful for all to enjoy.